Here comes to you an offer from 9mobile[ formally Etisalat] as it partners with Samsung Mobile to gives its users free data Bunus. Recently we disclose to you about on how to get Free 4GB on MTN and Airtel upon upgrading to 4G LTE. This time around 9mobile offers free 1.5GB/2GB and data Bunus via Samsung member app. Looks like a season of offers..!! 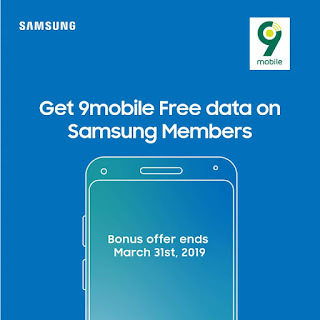 This offer is only for 9mobile users witth Samsung android phones, so if you are have a 9mobile sim but not a Samsung user, sorry this offer is not for you but read on to get informed. Samsung users can get 1.5gb,2gb free data instantly and 100% bonus on all data bought for 6 months + additional 50% data bunus in the next 6months. This means that after an instant free 1.5/2GB, assuming if you buy 1.5gb data you will be given an extra 1.5gb for free. Unfortunately this offer is for selected Samsung devices only. This was stated by Samsung Mobile Nigeria on their social media pages. They also said that the offer differs amongst the 4 devices, For Samsung Galaxy J6+ and J4+ users, they will be given 1.5gb free and 100% data would be given to them when they buy data for the first 6 months then 50% data bonus on all data purchased for the next 6 months. While for Galaxy A7 and A9 users are to get instant free 2gb and subsequently be given 100% data bonus on all data purchased for 6months and another 50% data Bunus for the next 6 months. Meaning that there is a whooping 500MB difference between galaxy J4+/J6+ and A7/A8 respectively. Then Register/login with your 9mobile sim details and that's all. Note that this bonus offer is valid till 31st of March 2019, after that only registered users would be eligible for the 100% bonus.